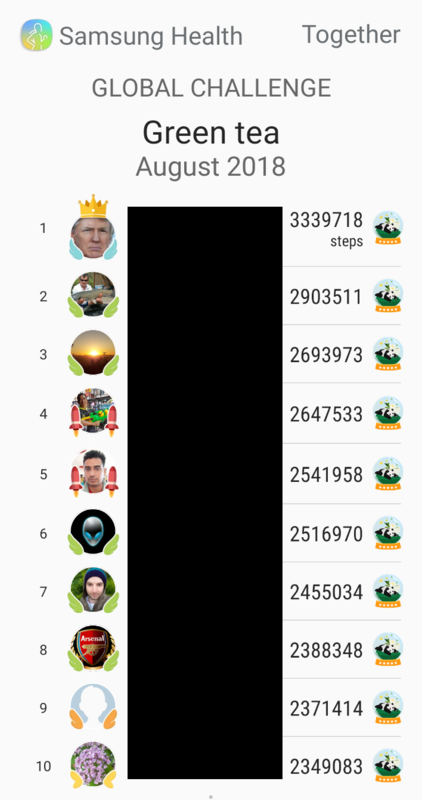 I use the Samsung S-Health app which has a global step challenge with a public leaderboard. To complete the challenge, you need to walk 200,000 steps in the month. Fifth place has ~2.5 million steps. 2.5 million / 27 (days so far) = ~92593 steps/day! As someone who walks ~8k steps a day, and has a record count of 40k steps in one day, 90k steps a day on average seems impossibly high. I filed a report to Samsung noting how the counts seem suspicious, and they replied, assuring me that they take cheating seriously and that the leaderboard is legitimate. Is it remotely feasible to walk more than 90,000 steps a day, every day for a month? Is this something that someone may do in the course of training or some running sport? In effect, the people at the top of this list are saying that they walk an equivalent of 50 miles a day or so, every day. Finding myself skeptical, I've done a bit of research. A world-class race walker can cover 50 km in about four hours. That translates to about 30 miles in four hours. That means that walking at that pace would require about seven hours to cover 50 miles, if one could keep it up that long. After a 50k race, a competitor typically needs two to three weeks to recover. So, it seems very feasible that there are thousands of people in the world who could cover 50 miles in 10 hours, at the rapid pace of five mph. (And billions who cold not.) It seems highly unlikely that there are more than a few people — if any — in the world who would be able to do it for 30 days in a row. I remain skeptical that these numbers are even remotely accurate, Samsung's assertions to the contrary notwithstanding. Edit: it would seem that we are far from alone in our skepticism of these numbers, to the point that the "challenge" appears generally regarded as something of a joke. I would say that it's highly unlikely but not impossible to take 90k steps in one day. The average adult's - male or female - stride length is 2.5 feet. Two steps is 5 feet. Doing the math (90,000x2.5)/5280, 90,000 steps equals about 42.6 miles. I would be very dubious that any person walks an average of 42+ miles every day. Maybe they attach the pedometer to their little Chihuahua. What is best for hydration during a run? What does it mean by “Hitting the wall” in marathon run?